TESTS on teeth from a skeleton of a teenager found buried near Stonehenge suggest they came from someone who grew up around the Mediterranean Sea. The remains of the youngster – estimated to have died 3,550 years – were found with a distinctive amber necklace. The conclusions come from analysis of different forms of the elements oxygen and strontium in the skeleton’s tooth enamel. The teenager, known to archaeologists as the boy with the amber necklace, was found in 2005 about 5km south east of Stonehenge on Boscombe Down. 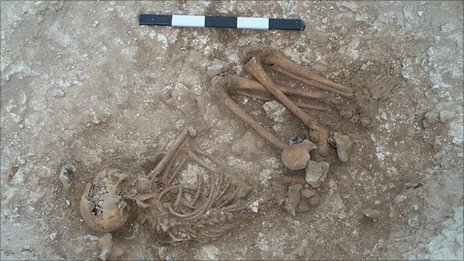 It was discovered next to a Bronze Age burial mound while roadworks were being carried out. The findings indicate that a diverse range of people who came to Stonehenge from across Europe. The findings will be discussed at a science symposium in London to mark the 175th anniversary of the British Geological Survey (BGS). >How Stonehenge and Avebury are managed – have your say now! There’s just time (until the end of the month) to have your say on a formal British document to be submitted to UNESCO laying out, inter alia, how Stonehenge and Avebury ought to be managed. In that case, we would like to say that a very obvious “change in the management and protection context“ which has emerged over the last 25 years is the fact that there has been a vast growth, due to the internet, in the number of people nationally and internationally who have a strong personal interest in the WHS and make frequent repeated visits to it and these now comprise the overwhelming preponderance of stakeholders – yet their needs are not addressed in a way which reflects that fact. Even the introductory remarks of this consultation exercise betray a failure to recognise this reality: “This consultation provides an opportunity for local people, community groups and other organisations to comment on its Statement of Outstanding Universal Value”. The clear message is that unless you are local or a member of a community group or other organisation this consultation is not for you. The first section, the Statement of Significance, was agreed by UNESCO’s World Heritage Committee in 2008 after a period of consultation and sign off by the Stonehenge and Avebury Steering Groups representing key local and national stakeholders. >Britain is littered with Stone Circles. Britain is littered with the remains of past lives, civilisations and cultures, many of which remain a source of mystery and conjecture. We may never know the exact reasons why these circles, standing stones, henges, hill-figures and monuments were erected or the peoples and belief systems that led them to complete some of these sometimes massive structures such as Silbury Hill and Stonehenge. These pages are an ongoing investigation into some of these ancient sites and landscapes with a view to gaining an understanding of the lives of the people who inhabited these islands more than 2000 years ago..
Obviously it is beyond the scope of this blog to hope to document every British prehistoric monument – there are estimated to be well over 1000 stone circles alone and the number of identified round barrows currently stands at over 10000. The sites I have included (currently about 350) are simply those that I have visited in England and Wales and cover a fair cross section of the pre-Roman sites in these countries, although the odd Roman remain is featured – I have yet to visit any sites in Scotland or Ireland. There are also several sites which have been included either because their age and purpose is unknown, or they may just be local curiosities. The areas of Lincolnshire, Humberside, Derbyshire and Yorkshire feature more pages than other regions, not because there are necessarily more ancient sites here but simply because they the closest to where I am based and therefore have received more frequent investigation than sites further afield. Moor Divock Cairns Bronze Age Burial Mounds. The Cockpit Bronze Age Ring Cairn. The Cop Stone Natural Rock Feature/Alignment. Sunkenkirk Bronze Age Stone Circle. North of Hallthwaites. Appletreewick Bronze Age Stone Circle. East of Hebden. Page 1 (North) Bronze Age Carved Rocks. Page 2 (North) Bronze Age Carved Rocks. Page 3 (Centre) Bronze Age Carved Rocks. Page 4 (West and East) Bronze Age Carved Rocks. Brow Moor Area 5 Page 1 Bronze Age Round Barrows. Brow Moor Area 5 Page 2 Bronze Age Round Barrows. Brow Moor Area 5 Page 3 Bronze Age Round Barrows. Brow Moor Area 5 Page 4 Bronze Age Round Barrows. Brow Moor Area 6 Bronze Age Carved Rocks. Brow Moor Area 7 Bronze Age Carved Rocks. Stony Marl Carved Rocks Bronze Age Carved Rocks. Backstone Circle Stone Circle ? Bradup Circle Bronze Age Stone Circle. Great Skirtful of Stones Bronze Age Round Cairn. Little Skirtful of Stones Bronze Age Round Cairn. Twelve Apostles Circle Bronze Age Stone Circle. See also individual monument pages above. 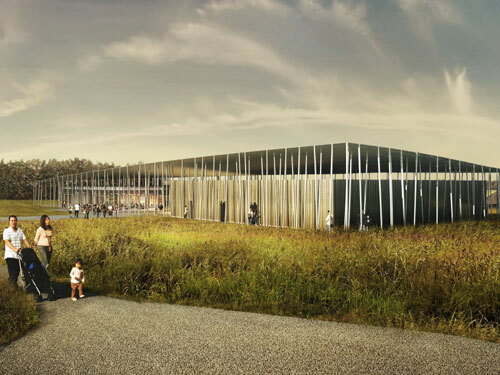 >New Stonehenge visitor centre to open in 2013? >The new visitor centre planned for Stonehenge in Wiltshire could open its doors by 2013 if funding can be found, according to a report in the Salisbury Journal. It was announced earlier this year that the coalition government would not be providing the £10m funding promised by the former Labour administration towards the centre’s £27m price tag. At a meeting of Wiltshire Council’s Amesbury Area Board on 2 September, EH project development manager Martin Harvey said: “We believe the project remains absolutely achievable.